You may remember my Banana Berry Smoothie that I shared early on in my Becomingness journey. It is was a real simple smoothie, you blend banana, raspberries and almond milk. The result was a pretty tasty smoothie that was packed full of nutrients. However, after seeing all these smoothie bowls around, I decided that my banana berry smoothie needed a facelift. If you don’t know what a smoothie bowl is, I will quickly explain it. 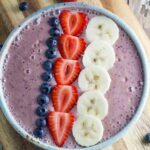 It is basically a smoothie in a bowl (instead of a glass!) with extra ingredients added on top. Instead of drinking it, you eat it with a spoon. But the end results looks way better than if it was just poured into a glass. For my new and improved version, I changed the ingredients to banana, strawberries and blueberries (which is pretty obvious by my photos). You can go to town with the toppings, but I decided to keep it simple and just top with the actual smoothie ingredients. Other toppings that would work include granola, any seeds, any nuts, coconut flakes and other fruit. Banana, strawberries blueberries, nuts, seeds, coconut flakes, granola and other fruit.